The new Slab Scalper designed and manufactured by MINO S.p.A., is a state-of-the-art Slab Scalping Machine using lubricant-free cutting technology which allows to maximize the chips recovery and reduce the pollution of the process. The Slab Scalper is equipped with a single vertical milling head of 2200 mm diameter driven by a single 640 kW AC variable speed motor capable up to 20 mm of scalping depth per pass and two side milling heads of 550 mm diameter driven by 132 kW AC variable speed motors to side mill the slab with different shapes. The equipment has been designed from scratch having in mind some key targets: effective chips containment system, easy access to the mechanical groups for maintenance, vibration free operation and long-lasting service life. The special features that have been incorporated in MINO’s design together with the use of heavy-duty mechanics allow to achieve high productivity and superior surface/shape quality in the outcoming slabs, which are necessary preconditions for targeting good results in the subsequent hot rolling process. The control system is complete with a novel and original technology developed by MINO Automation which, by employing an advanced laser-based 3D scanning system, detects the actual slab profile geometry as DC casted and automatically pre-sets the scalping depth in order to minimize the scrap and optimize the surface quality of the slab. 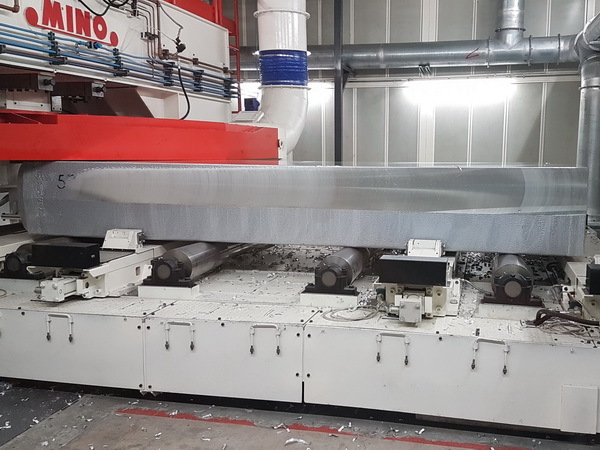 The new MINO Slab Scalper capable to scalp 1800 x 600 x 6000 mm slab weighing up to 13 tons, it is installed in Profilglass Hot Rolling workshop upstream of the MINO Hot Rolling Mill.